The world [né] is flat. There was a flood because of man's wickedness. One man, Nagaicho, flattened the world when he made it over. He had tall timber and jumped on top of it until the water went down. He studied what to do then. He went to the ocean and worked and patched up the banks and opened the rivers quickly. Then he planted plants and bushes. He made everything easy for man. Man is the one who makes it hard for himself because he does so much wrong. Between Cape Vizcaino and Point Delgada are several small, exposed landings available for use only in the summer and in smooth weather. These landings ship ties, tan bark, and shingles, and then only when they can be handled at a profit; and the landings are abandoned or revived according to commercial demands. Wire cables are used in loading and discharging, mooring buoys being placed where necessary. Supplies are not obtainable and communication is irregular. The principal landings are Rockport, Monroe landing, Usal, Bear Harbor, and Needle Rock. The road passed through a region of prosperous farms, and gradually approached the coast, which here is not high, though backed by broken ground that rises to the dignity of hills. Blocks of dark timber diversified the landscape, and the shore was picturesquely varied with storm-blown spruces and a foam-ringed islet or two. I gazed with particular interest at the northward reaches of the coast, for though there was nothing notable in the view, I realized that at last I was looking up the coast at Oregon. For nearly three decades after American occupation of California, "Indian wars" continued-the Klamath War of 1851-52, Kern River War of 1856, Pit River massacres of 1867, and the Modoc War of 1873. During the campaign of 1855-59 in the north, soldiers killed more than 100 Indians, while settlers of the Mad and Eel River regions put at least 200 to death in a series of massacres. Needle Rock, 46 feet high, is 14.5 miles north of Point Vizcaino; the rock blends into the bluff from offshore. A group of old mill buildings, a few houses, and an old landing platform about midway up the flat mark the abandoned landing. 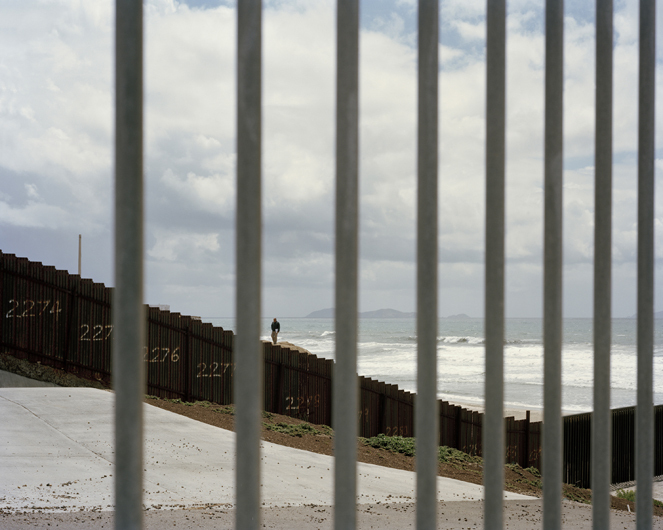 There is no seven-foot barrier, no armed patrols backed by the technical wizardry of modern warfare directed against guerilla movements, no dense toxic sludge that breeds diseases at the northernmost coastal portal into the state of California. Those physical impediments are at the very southern end of the narrow coastal strip. The differences between Oregon and California are far more subtle and less dramatic than those between California and Mexico. Take, for example, the two units of the state park systems of Oregon and California that straddle the border within a quarter mile of each other. The short road into the Oregon park on the north side of the Winchuck River, where it empties into the ocean, is carefully graded and neatly delineated by boulders. Just south of the California Agricultural Inspection Station, there is a sharp turn to the ocean. The road into Pelican Beach State Park is pockmarked by deep potholes, dusty, and littered with trash and discarded household items, including a table and rug. It is used, in other words, as a dump. What this tells me is that Oregon has managed to maintain an orderly presence, while the Golden State has lapsed into disrepair. I have clear memories of sitting here on Pelican Beach on a warm, early fall day and watching Alex climb over the weathered driftwood logs and play in the sand. In this land of nearly perpetual fog or rain, I have somehow had the luck to return on the same type of day, when there is, and was, "an aching intensity of light and color." The same restaurant, slightly enlarged, still stands just to the south, but the modular cottages stained a redwood color, which can be rented or purchased, are new. Oceanview and oceanfront are the words used most frequently to advertise dining, sleeping, residential, and commercial attractions. The words are scattered along the roadside for a few miles beyond the Tolowa Indian gaming casino, up to the point where Highway 101 bends inland. I stopped at the inspection station to find out who was entering California and what they were bringing with them. Al Mikkelsen was on the lookout for western fruit flies in cherries, gypsy moths in webs spun on the underside of recreational vehicles, tan oak that might be harboring sudden oak death, exotic Quaker parrots, and various other noxious items. In the summer months he checks between twenty-five hundred and three thousand vehicles during an eight-hour shift. In winter, there are one-third that number. Many of the people passing through are locals who live in nearby Brookings, Oregon. Quite a few of the locals work at the Lucky 7 Casino or Pelican Bay State Prison, which is inland and south of the bay whose name was appropriated by California's most notorious supermax prison. The back road that leads to the prison has an unusual number of small cafés advertising espresso coffee. I can only guess the guards need to get jacked up before going to work. Mikkelsen too lives in Brookings, where state taxes are lower, the annual vehicle registration fee is only fifty-two dollars, and gas, which is by law dispensed by an attendant, is forty cents less a gallon than in California. "Hi there. Any fresh fruit on board?" And, easy as that, the visitor was in California. South of Ferndale and Petrolia on the narrow coastal road, and west of Redway and Garberville on the 101 freeway, is the Lost Coast, the wildest and least-trafficked section of the California shoreline. There are no roads or railroads along the coast here, as there are elsewhere. Three roads provide access at points at the north, middle, and south end of the fifty-six-mile stretch of shoreline that extends from the mouth of the Mattole River to Usal Creek. Except for the Shelter Cove subdivision in the middle of the wilderness, the Lost Coast is protected. It is divided into the King Range National Conservation Area on the north and the much smaller Sinkyone Wilderness State Park on the south. Steep mountains, grassy meadows, and thick forests tumble downward to meet the metric beat of the relentless ocean waves upon the rocky shoreline. But the Lost Coast is neither lost nor wild in the strictest senses of those words. Its name was applied the 1930s, when many of its inhabitants fled during one of the periodic logging depressions. 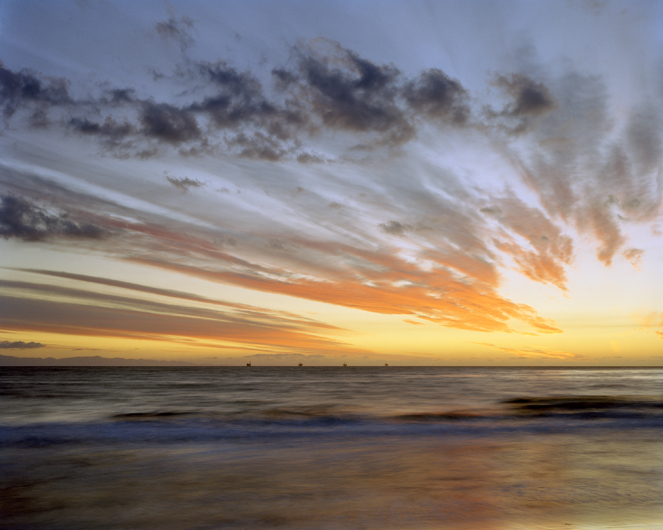 This stretch of coast has since been repopulated by visitors who like to hike, fish, and surf. The long airstrip at Shelter Cove was once used by small commercial airliners to transport prospective lot purchasers back and forth from Southern California. There is a smaller landing strip serving a remote campground also reachable by hikers on the coastal trail and by high-speed motorboats carrying surfers and campers who do not wish to lug heavy packs across sand and rocks. Inland, the main crop is marijuana, which represents somewhere between 25 and 75 percent of the local economy, precise measurements being impossible to determine because of the illegal nature of the crop. It's best to heed the numerous "No trespassing" signs. This is a land of geologic and climactic extremes. There are frequent earthquakes caused by the nearby meeting of three tectonic plates, 150 inches of yearly rainfall, 16 inches of rain from a single storm, landslides thundering down steep four-thousand-foot hillsides, hot summer days exceeding one hundred degrees, and cool summer fog two hundred miles north of the urban comforts of San Francisco. The natural and human histories of the coast begin here with the coast redwood trees and the Sinkyone Indians, whose stories are intertwined and parallel each other. 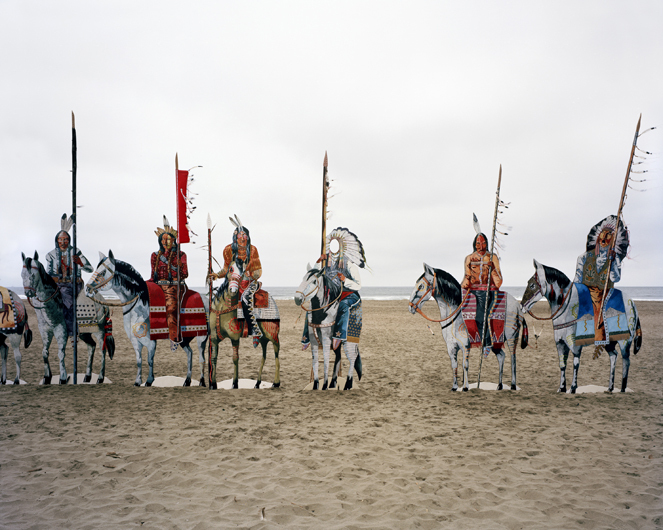 They represent the tales of other endemic species and Native Americans in California. Both were abundant, both were nearly eradicated, and the populations of both have stabilized if not increased in recent years. Their histories can be told through the stories of three virgin redwood groves and a second-growth Douglas fir and tan oak forest in the Sinkyone Wilderness section of the Lost Coast. The range of the redwood tree, more formally known as Sequoia sempervirens, extends from just above the Oregon border to southern Monterey County in the midsection of the state. The redwood is extreme in terms of grace, majesty, spirituality, age, and height. The world's tallest living tree is a redwood that reaches the height of 379 feet. These deviant trees have attracted more tourists and local visitors to ancient redwood groves in state and national parks than any other arboreal destinations in the state. The roadside attractiveness of redwoods is so great that the coastal region north of San Francisco is known as the Redwood Empire. The fossil record indicates that the redwood genus of trees (Sequoia) has existed for as long as 240 million years, meaning as far back as the age of the dinosaurs. The trees once circled the globe in the temperate midlatitudes. A sempervirens variety was present in the Rocky Mountain states 60 million years ago. The tree migrated westward to southern California 40 million years ago, escaping extreme summer and winter temperatures. As southern California became warmer during the Pleistocene period, the redwoods' range narrowed to their present humid coastal niche in central and northern California. The drip of frequent coastal fogs adds between 25 and 50 percent to the annual rainfall, which in itself is no small amount. About 8,000 years ago, humans arrived where redwoods grew. Some of the oldest redwood trees alive today predate the birth of Christ by approximately 200 years. Middle-age trees were seedlings during the medieval warm period, 600 to 900 years ago. Younger redwoods date back to the little ice age, 150 to 350 years ago, proving climate change is a constant. 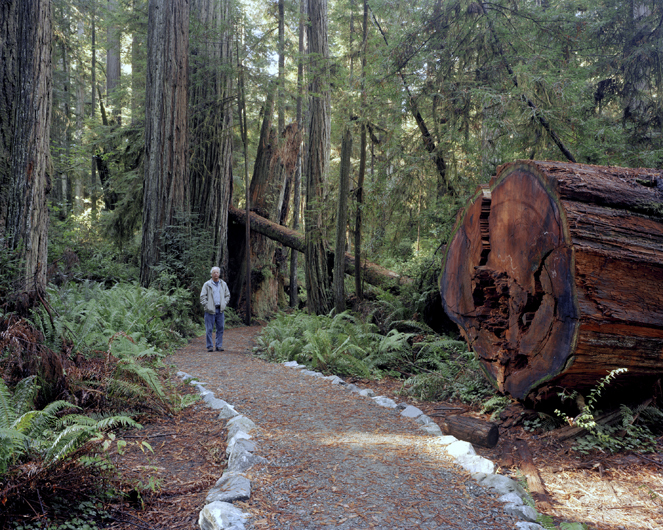 It took only sixty years to seriously deplete the old-growth redwood forest. Steam- and gas-fed engines, the post-World War II housing boom, and the boutique use of redwood greatly hastened its near demise. The wood was coveted for its fire-resistant quality, resistance to rot, lack of shrinkage, and attractive reddish grain when freshly cut, and gray weathered patina when aged. It was also cheap, at least initially, because of its abundance. Redwood was used for the exterior walls of offices, homes, barns, and shacks and to make grape stakes, shingles, shakes, wine vats, water tanks, hot tubs, water fumes, floodgates, bridges, trestles, wharf pilings, furniture, fences, and coffins. From the excesses of the Victorian mansions in redwoodland to the starkness of the mining-camp-inspired architecture of modern Sea Ranch on the Sonoma coast to the Bernard Maybeck-inspired California bungalows in the San Francisco Bay Area, redwood was the tree of choice. From around 1900 to the 1960s, the world knew redwood in abundance. 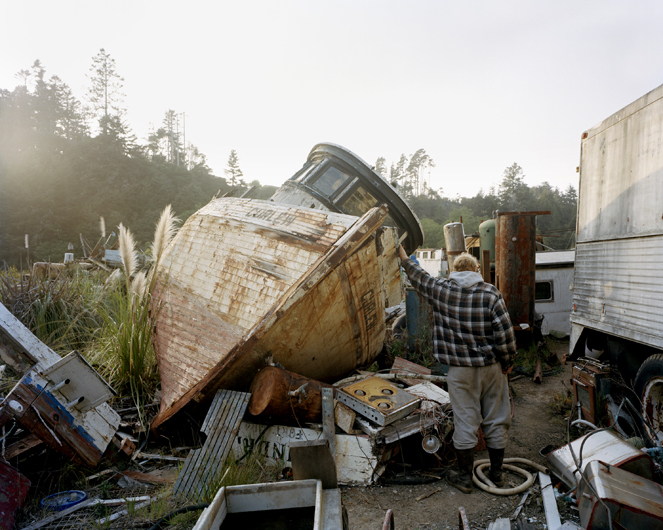 Then the decline began, leaving the spare remains of logging settlements scattered along the coast of the Sinkyone Wilderness and elsewhere in Northern California. These remnant workplaces and habitations have become almost invisible after only fifty years, which is a tribute to the fecundity of the landscape. They are stark reminders of the transient occupancy of humans upon a landscape belonging to no one except the particular animal species or human group living upon it during a passing moment in time. Drive south from Ferndale or west from Garberville, and the paved road becomes narrower and more circuitous and the evidence of human habitation more fleeting, until finally the road descends steeply and becomes a narrow dirt track accommodating one vehicle with a few turnoffs for oncoming traffic. A few bumpy miles later, it ends in what was once an orchard. Bear Harbor is less than a half-mile walk to the south. A retaining wall and a few domestic plants that have survived in the wild are the only signs of what was once a throbbing logging enterprise. A great future had once been foreseen for Bear Harbor. A member of an exclusive San Francisco hunting club who was traveling the coast in 1857 commented on the possibilities of the harbor: "Taking into view the remarkable progress of California, it certainly is not anticipating too much to look forward to the day when Bear Harbor will be a great emporium of commerce and industry." White settlers followed Sinkyone Indian footpaths into the Lost Coast area in the early 1860s, when the land was opened to homesteading as the Civil War raged far to the east. The Humboldt Trail was cut along the ridgeline to the east of Bear Harbor. It carried foot, horse, and mule traffic up and down the coast from Eureka to Fort Bragg, with a westward branch to Bear Harbor and nearby Needle Rock established in 1865. Sheltered from the prevailing northwest winds by rocks off a minuscule point, but not from storms from the south, landings from sailing ships were first made on the black sand beach. Redwood railroad ties, posts, shingles, and profitable tan oak bark, from which tannic acid could be extracted, were transported to the tossing offshore vessels. The acid was used to process leather goods in forty California tanneries. A new process was found. Tan oaks are now considered a trash tree susceptible to sudden oak disease. Orchards were planted in meadows where livestock grazed. Ranch houses and line camps clung to hillsides or found a bit of flat space in the narrow canyons. It was a precarious and extremely remote life, particularly in the wet winter months, but at least there was a bare living to be made as long as the trees lasted. The harvesting of timber intensified when Bear Harbor became the center of regional logging activity near the end of the century. Money, machines, and the inventiveness and persistence of humans under extremely harsh conditions made it possible. A five-hundred-foot wharf with pilings inserted into holes drilled into offshore rocks housed a steam-driven donkey engine that drove a cable used to load and off-load cargo from ships anchored three hundred feet beyond the end of the wharf. A badly degraded Railroad Creek flowed through the narrow canyon that flared into what was once a small coastal marsh at Bear Harbor. In the canyon and spilling onto the former marsh were sheds, residences, bunkhouses, a schoolhouse, stacked lumber products, and a railroad. More than one thousand feet of vertical rails connected the landing with what was then the Humboldt Trail and is now the Usal Road at the six-hundred-foot level of Jackass Ridge. Gravity, horses, and propulsion furnished by a steam engine were used to propel and brake the cars. From the top, tracks were laid ten miles to the settlement of Moody, where an engine house, repair shops, and a warehouse were constructed. A hotel, saloon, general store, and post office were built during the boom, but a promised tan oak bark mill never materialized. Then disaster struck, bringing a temporary halt to the vulnerable transportation system that served the region. Two men were working on the Bear Harbor wharf on November 21, 1899, when a giant rogue wave rolled in from the west, lifted the dock, and tore it to pieces. As the wave receded, one man was seen clinging to a bush on the nearby bluff. He was rescued. The second man was never seen again. A vast forest consisting of fifteen thousand acres of redwood, Douglas fir, and tan oak, along with the facilities at Bear Harbor, Moody, and what would become Andersonia, were purchased in 1903 by Henry Neff Anderson, who sought, like others, to put his mark upon the landscape. Huge trestles held in place by tall redwoods and long tunnels drilled through rock extended the railroad seven miles from Moody to Andersonia. A large dam, ten lumber camps, a mill, a town, and a house on a hill for Anderson were hewed out of the wilderness. The owner inspected the almost-completed mill in late 1905, but he never lived to see it operate. Anderson was struck on the head by a falling timber and died. Later, strong tremors from the San Francisco earthquake of 1906 did extensive damage to the fragile structures. The Bear Valley school closed two years later, signaling the end of that settlement. Moody and Andersonia melted back into the landscape. Near the start of the five-mile trail that leads south from Bear Valley to Wheeler, the narrow track passes through a patch of redwoods named the J. Smeaton Chase Grove. Chase set out in 1910 to traverse the entire coastline on a horse. As happens periodically, California was on the cusp of change, with the Panama Canal about to be completed and automobiles already on the road. Chase wanted to see the state before its past disappeared. He rode south from Los Angeles to San Diego the first year, and then continued his journey from Los Angeles northward in May of 1911. By fall of that year he was in the Lost Coast country. He wrote, "We entered now a wonderful tract of forest, the finest I had seen, and evidently virgin, for there was no mark of either cutting or fire." The day was clear and hot, as autumn days on the North Coast can be. "It was an immense relief when evening shades came with delicious temperature, and I rode on leisurely through the grateful gloom, catching glimpses through forest windows of a gorgeous sunset that dulled and died imperceptibly into the clear indigo of nightfall." I hiked the trail on a similar day. From the redwood trees in the canyon of the Chase Grove, the trail ascended to the top of steep slopes that fall precipitously to the sparkling Pacific Ocean and the silent, white-fringed surf that defines offshore rocks. The trail eventually dropped through shaded School Marm Grove and the recently deserted logging settlement of Wheeler. School Marm Grove, now a campsite on the coastal trail, had been the site of a small red schoolhouse that also served as the community center. Approximately thirty students in grades one through six and one teacher were its weekday occupants. On weekends there were church services and Sunday school. Evenings there were potluck dinners, dances, and various social and community gatherings. The air here had once been filled with the roar of logging trucks revving up to tackle the steep grade or downshifting on the descent from Usal Road, the screech of band saws, and smoke from the kiln. A freak windstorm tore the roofs off structures, scattered lumber, damaged water pipes to the extent that residents thought it was a heavy rainstorm, and silenced the diesel engines that furnished power to the logging camp. The inhabitants were amazed by the sudden quiet. The only remains of a bustling industrial complex that I could find were a few moss-encrusted concrete piers, partially covered by leaves, that had been a foundation for some type of structure, a small patch of asphalt roadway, and a rusted rectangular form that had supported a drum and cable system. Wheeler had a brief, intense existence from 1950 to 1960. Its genealogy was extensive for its short life, indicating a frenzied hunt for riches. The Wolf Creek Timber Company, Warm Springs Lumber Company, Pacific Coast Company, Union Lumber Company, Boise Cascade Corporation, and the Georgia-Pacific Corporation were successive owners. When the last owner departed, all the structures were burned to the ground, leaving the breeze blowing through the vestigial forest. Up the abandoned road from Wheeler, and near the headwaters of Little Jackass Creek, is the Sally Bell Grove, named for a Native American. No one knows who the first human inhabitants of the Lost Coast were; but the Sinkyone people, speaking a variation of Athabascan language patterns, arrived around 1400. The Shelter Cove Sinkyone, consisting of four tribelets in eighteen villages, occupied what would become the state wilderness area. They migrated with the seasons, moving from the warmer, sheltered inland valleys to the more exposed coast along narrow, steep pathways. In the coastal waters there were salmon, steelhead, smelt, marine mammals, shellfish, and seaweed. On land there were beached whales, black-tailed deer, elk, and tan oak acorns whose meal was prized by the Indians for its delicious flavor. Fire was both a useful tool to cultivate the woodlands and meadows and an inadvertent danger. The coast redwood served many purposes. The Sinkyone pursued seals and sea lions in canoes fashioned from downed redwood logs hollowed out with fire and obsidian-tipped tools. Their shelters were either conical or wedge-shaped and were fashioned from thick slabs of redwood bark bound to poles with iris fiber. The bark was peeled from the trees with elk-horn wedges and a stone maul. One of the materials woven into their baskets was redwood root fibers. Up until the early 1850s, there were a little more than two thousand Sinkyone Indians occupying 350 square miles. "They were a people that got along with little," wrote University of California anthropologist A.L. Kroeber, "[and] that little the common stock of themselves and their neighbors, and as impartially the neighbors on one side as the other." Fifty years later there were a hundred. The language was eventually lost, and the group never gained official status as a tribe. One of the Sinkyone who survived into the 1930s was Sally Bell. Sally was a young girl when the acorn crop failed one year. The Sinkyone and other Indians pilfered livestock and potatoes from white settlers. The settlers in Mendocino County petitioned the local Indian agent, stating that they were about to "exterminate" the Indians unless a schooner-load of potatoes was delivered. No potatoes arrived, and what became known as the 1859-1860 "Mendocino Wars" were waged indiscriminately by a private army against all Indians. After holding hearings in the region, a special committee of the California Legislature condemned the whites and said more Indians had been killed during those two years than during the entire eighty years of Spanish and Mexican rule. Sally lived with her family and other Sinkyones at Needle Rock. It was ten o'clock in the morning when the white men appeared. They killed my grandfather and my mother and my father. I saw them do it. I was a big girl at the time. Then they killed my baby sister and cut her heart out and threw it in the brush where I ran and hid. My little sister was a baby, just crawling around. I didn't know what to do. I was so scared that I guess I just hid there a long time with my little sister's heart in my hands. I felt so bad and I was so scared that I just couldn't do anything else. Then I ran into the woods and hid there for a long time. I lived there a long time with a few other people who had got away. We lived on berries and roots and we didn't dare build a fire because the white men might come back after us. So we ate anything we could get. We didn't have clothes after a while, and we had to sleep under logs and in hollow trees because we didn't have anything to cover ourselves with, and it was cold then-in the spring. After a long time, maybe two, three months, I don't know how long, but sometime in the summer, my brother found me and took me to some white folks who kept me until I was grown and married. Sally later saved the life of a white baby. In 1901, when Roy Cathey was about to be born, the Garberville doctor didn't arrive on time at Four Corners on the ridge above Needle Rock, so Sally delivered the baby. "It was three o'clock in the morning, and I was a blue baby," Cathey recalled years later. "Well, she mumbled something to old Tom in Injun, and he took off. He come back, Dad said, with a bunch of roots about like that and she had a pot of water goin', she threw them roots in there and steeped it up, whatever it was. Dad said just quick as I took it, I commenced to perk up. Now what it was, I don't know." Cathey referred to Sally as "the old squaw with the hundred eleven on her chin." Sinkyone women were tattooed with three vertical lines on their chins. Sally was the last full-blooded Sinkyone Indian. In the early 1980s, Georgia-Pacific wanted to cut the redwoods in the Sally Bell Grove. People chained themselves to trees, there were arrests, and a lawsuit halted Georgia-Pacific's logging operations in the Sinkyone. A deal was cut, and seventy-one hundred acres were purchased by conservation-oriented groups. About half the acreage filled out the state wilderness area to its present boundaries. The remaining thirty-nine hundred acres on the east side of Usal Road-the drier, second-growth Douglas fir and tan oak forest-were held for "multiple-use" purposes, which could, and still might, include logging. With a gift of $1.3 million from the Lannan Foundation, eleven federally recognized California Indian tribes took possession of the thirty-nine hundred acres extending north from Usal, under a conservation easement to be monitored by the Pacific Forest Trust, which specializes in saving private forests. The goal was to regrow a mature redwood, fir, and tan oak forest, encourage the revival of Indian forest customs and crafts, provide Native American employment and income from limited ecotourism, and extend the public trail system and establish camping sites. I recently passed through the Indian lands. What was most conspicuous were posted signs stating, Wilderness Unlimited: No Trespassing, Avoid Arrest, Members Only, Patrolled Area and steel gates blocking access to dirt roads. The Usal campground, at the southern end of the state wilderness area, was badly degraded. Banned off-road vehicles had carved up the creek bed, ocean-side bluffs, and beach while state park officials in Sacramento were putting the final touches on a bravely worded master plan for this area. Philip L. Fradkin, one of California’s most acclaimed environmental historians, felt drawn to the coast as soon as he arrived in California in 1960. His first book, California: The Golden Coast, captured the wonder of the shoreline’s natural beauty along with the controversies it engendered. 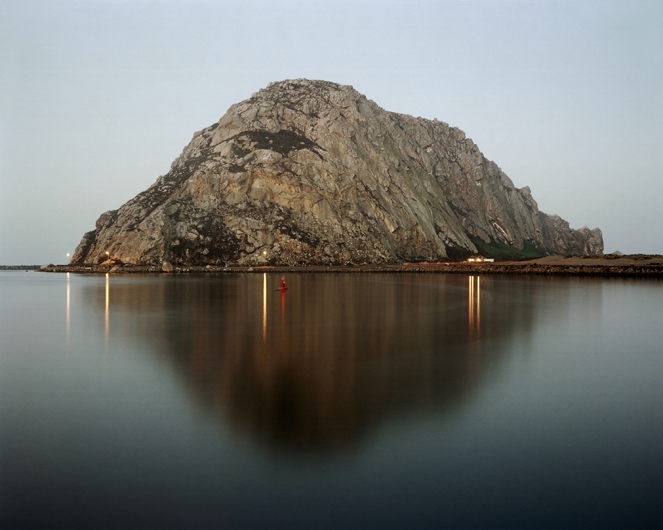 In The Left Coast, the author and his photographer son Alex Fradkin revisit some of the same places they explored together in the early 1970s. From their written and visual approaches, this father-son team brings a unique generational perspective to the subject. 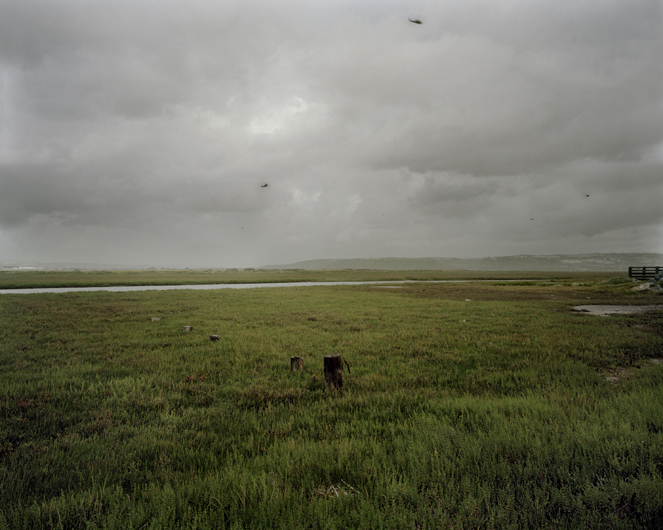 Mixing history, geography, interviews, personal experiences, and photographs, they find a wealth of stories and memorable sights in the multiplicity of landscapes, defined by them as the Wild, Agricultural, Residential, Tourist, Recreational, Industrial, Military, and Political coasts. 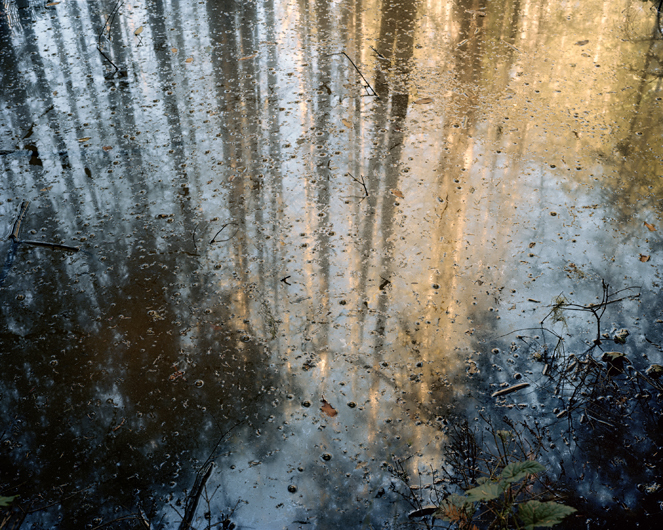 Alex Fradkin’s expressive photographs add a layer of meaning, enriching the subject with their distinctive eloquence while bringing a visual dimension to his father’s words. In this way, the book becomes the story of a close relationship within a probing study of a varied and contested coastline. Dead bird picked clean. Rodeo Beach, Sausalito, 2008. Dad and old growth redwood forest. Prairie Creek Redwoods State Park, 2007. Three surfers viewing wave conditions. Venice Beach, 2008. Santa Monica Beach. Santa Monica, 2008. “Wooden Indian” with no face. Ocean Beach, San Francisco, 2008. Tunnel access to Gun Battery 129. 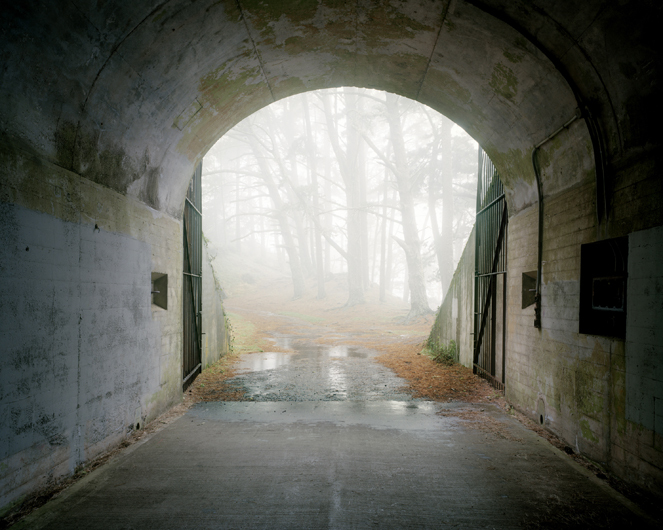 Fort Baker, Marin Headlands, 2009. Abandoned homes in old lumber town Samoa, near Eureka, 2009. Family and their little red truck on beach. 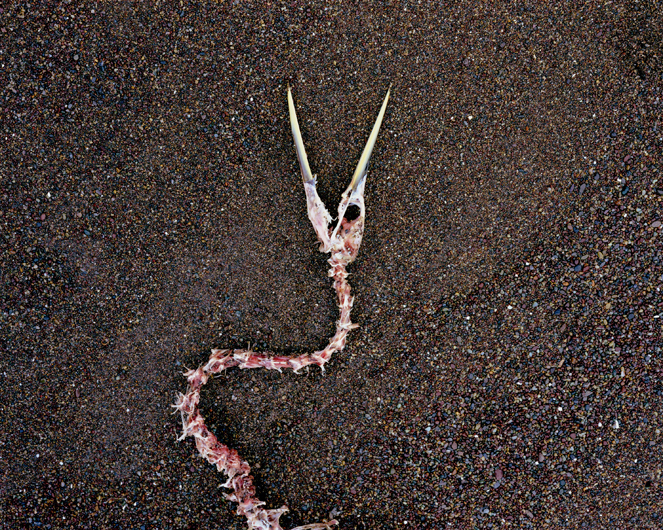 Pismo Beach, 2007. 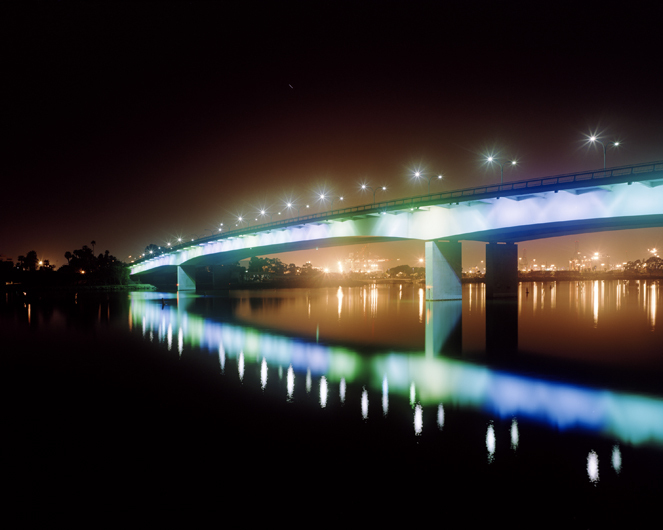 Illuminated bridge and shipping cranes. Long Beach, 2007. Josh on ATV. 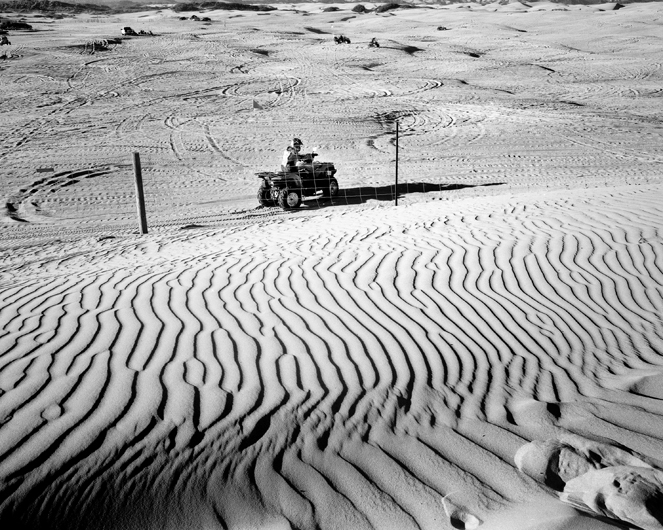 Oceano Dunes, 2007. Sag pond covering the San Andreas Fault. Fort Ross, 2009. Fishing boat salvage year overflowing after collapse of salmon stock. 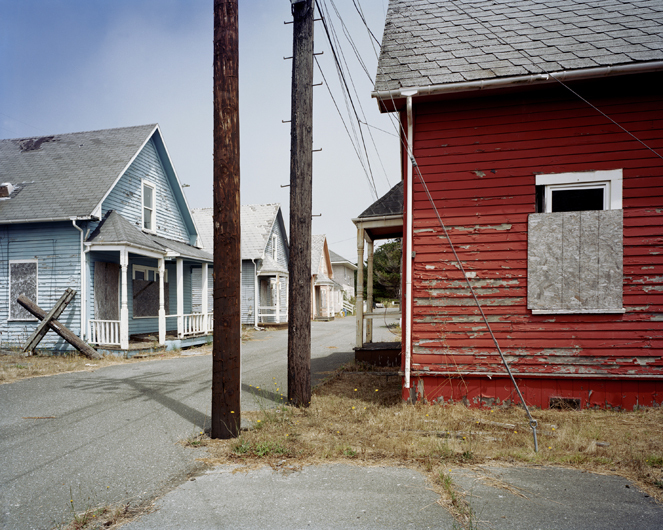 Noyo, Fort Bragg, 2007. 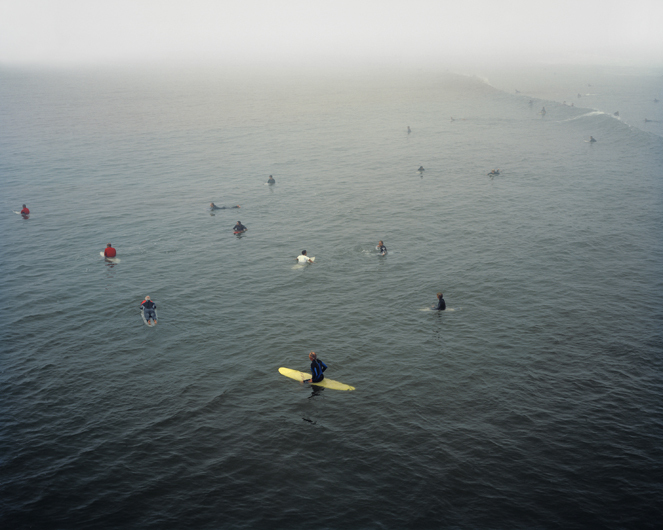 Surfers in fog waiting for waves. Huntington Beach, 2008. 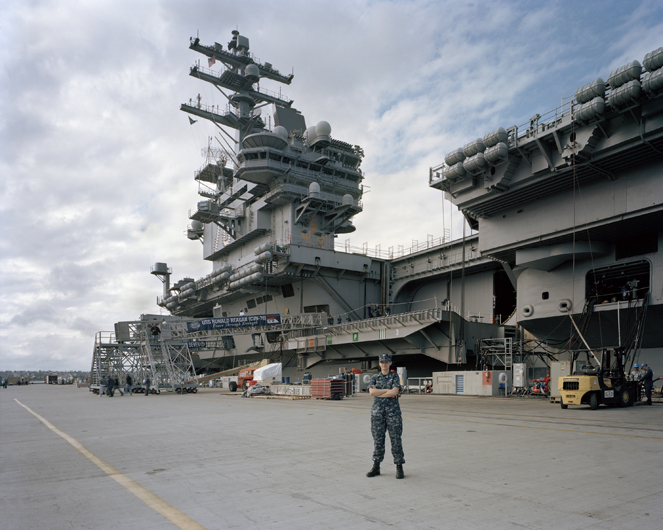 USS Ronald Reagan. San Diego, 2010. Photo shoot for a mobile phone advertisement; a controversial fence restricting beach access stands in the background. 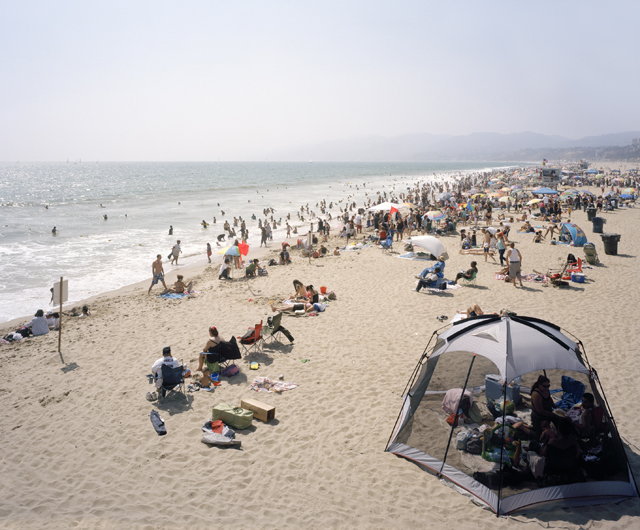 Malibu Beach, 2007. 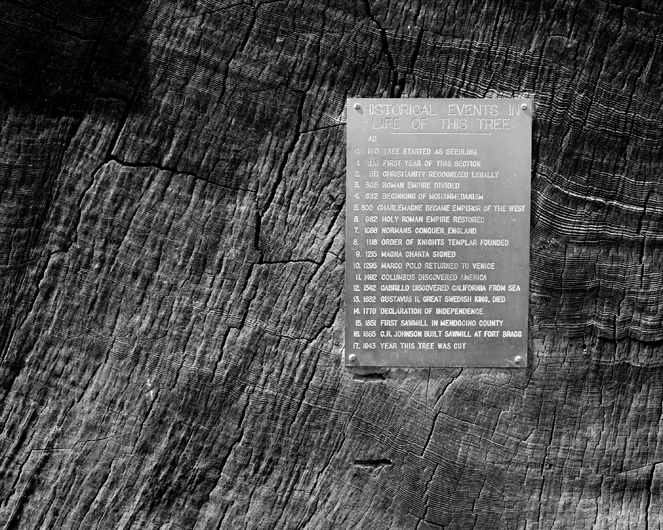 Historical Events in the Life of This Tree, A.D. 100 to A.D. 1943. Section of an ancient redwood tree trunk on display. fort Bragg, 2007. Tijuana Estuary and circling Blackhawk helicopters. 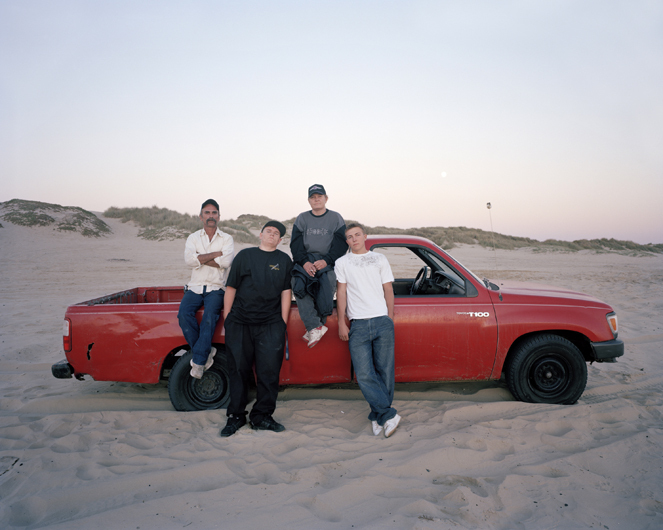 Imperial Beach, 2010. 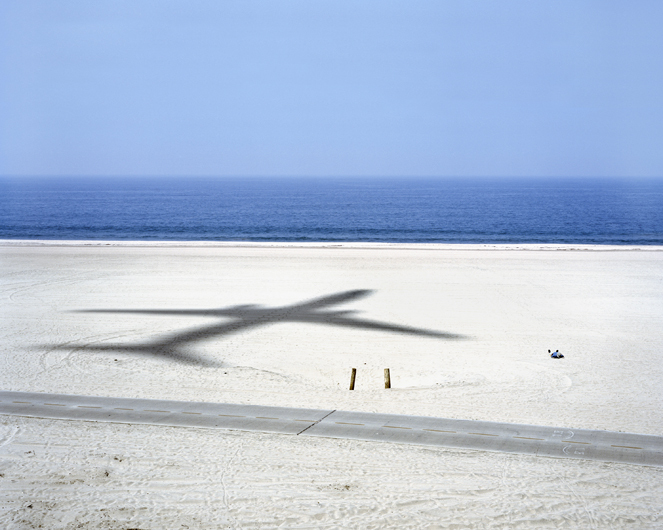 Dad napping on beach, and passing aircraft. Dockweiler State Beach, 2007.